Ned's new CD 'Culebra', featuring the Royal Scottish National Orchestra, Scottish Ensemble and Polish National Radio Symphony Orchestra, will now be released in the UK on June 23rd on Aruna Records. Distributed by RSK, available on iTunes, Amazon and from good record shops. You can listen to excerpts by clicking on the Listen tab above. If you would like to pre-order on Amazon click here. Click here for iTunes UK and click here for iTunes World. Music in search of stillness amongst the bustle of the 21st Century - Aruna Records presents ‘Culebra’, composer Ned Bigham’s moving collection of orchestral miniatures and ballads inspired by the British landscape, from the tranquillity of the Sussex Downs to the grandeur of the Scottish Highlands. With the album ‘Culebra’ Ned Bigham proves himself a composer of rare subtlety, and much of his music has a meditative, reflective quality. 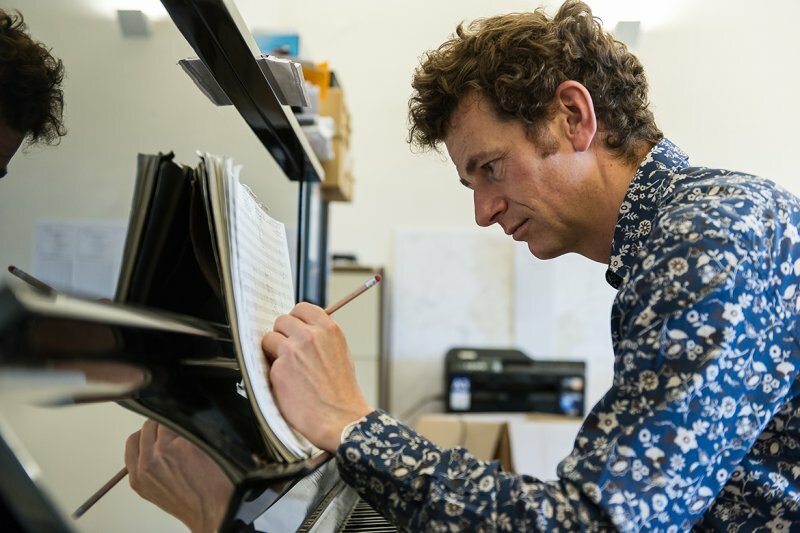 Influenced by composers as diverse as Vaughan Williams, Holst, Delius, Ravel, Mahler, Bryars, Part and Messiaen, ‘Culebra’ is a very personal body of work that reflects Ned’s ruminations on location and family, distant memories and history finding continuity in the present. The album is bookended by the two parts of the title piece, performed by the Polish National Radio Symphony Orchestra. Composed just before the death of his father, they are dedicated to him. Following this sad event, Ned left London and returned to rural Sussex in order to maintain the family estate, a move which fostered a newfound appreciation of landscape and nature, and inspired the epic, ambient texture of these movements. Also featured on the album is the Royal Scottish National Orchestra’s stellar performance of the composer’s collection of orchestral miniatures inspired by the grandeur of the Scottish Highlands, ‘An Caisteal’, ‘Glenfinglas’, ‘Sail Mhor’ and ‘Portsonachan’. Both orchestras are conducted by the acclaimed Gregory Rose, Music Director of the Jupiter Orchestra, Jupiter Singers, Singcircle and CoMA London Ensemble. The third part of this world premiere recording comprises ‘The Nairne Ballads’, five rhapsodies performed by the dazzling strings of the Scottish Ensemble. Commissioned by Creative Scotland in 2010, Bigham's inspired re-imaginings of Jacobite songs, including the famous ‘Bonnie Charlie (Will ye no come back again)’, were first performed by the Ensemble in that same year as part of Points of Departure - new music from Scotland in Glasgow's Centre for Contemporary Art. Subsequent performances have included The Crear Arts Centre in Argyll. Their original author, Ned’s ancestor Lady Nairne, came from a Jacobite family who sheltered Bonnie Prince Charlie in their home. ‘Culebra’ is a luscious sonic experience, a portrait of a singular voice in contemporary composition. Ned has just signed a publishing deal with Faber Music. Home to composers including Benjamin Britten, Thomas Ades, Carl Davis and Jonny Greenwood. Mark Rogers, ex Abbey Road award-winning audio engineer, is currently mixing the forthcoming cd of compositions, featuring performances by the Polish National Radio Symphony Orchestra, Scottish Ensemble and Royal Scottish National Orchestra. Ned has just completed a commission for West Sussex County Council. Sonnet XCII is a four part choral setting of the poem by Charlotte Smith (1749-1806). Performance details tba. We have now recorded four new pieces with the Royal Scottish National Orchestra at Henry Wood Hall in Glasgow. Gregory Rose conducted and the recording engineer was Calum Malcolm.